Lifetime bans will be handed down to the two fans that ran onto the Stockport County pitch to confront AFC Fylde players celebrating a last-gasp FA Trophy semi-final winner. Stockport director Jon Keighren spoke after one of the supporters appeared to shove defender Arlen Birch in the aftermath of Alex Reid’s 89th minute winner on Saturday, which sent the Coasters to Wembley. He said the club was “embarrassed” by the invasion, which came after repeated warnings not to go on the turf, and said: “We have been analysing CCTV and other footage in order to identify the two main offenders and we are continuing to liaise with Greater Manchester Police as this is a criminal matter. 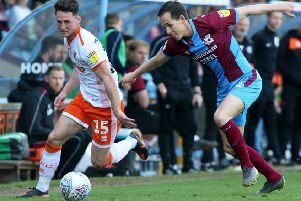 A fan in the stadium’s reception area also shouted an expletive at Fylde striker Danny Rowe after eyeing him through an open door to the tunnel, Mr Keighren said, though he called media reports saying a fan got into the away dressing room a “complete fabrication” and said: “There were no fans inside the away changing room at any stage”. The Football Association (FA) has launched an investigation into the incidents, which came just weeks after Aston Villa’s Jack Grealish was assaulted on the pitch by a supporter of rival club Birmingham City. The same day, an Arsenal fan ran on the pitch at the Emirates to shove Man Utd’s Chris Smalling.